By David Schissler – Loon Mountain Resort in Lincoln, NH is a busy place. With access just minutes off of US 93 it’s easily the state’s leader in skier days. Yet in spite of the volume of skier traffic that implies, it’s consistently among the top rated resorts in the Northeast for grooming. That doesn’t happen without committing substantial resources and a well-trained, dedicated crew. 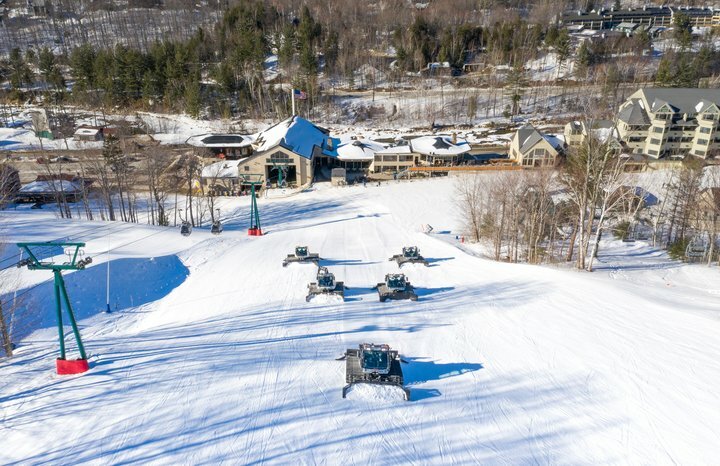 Loon has a fleet of nine snow cats. Seven are Prinoth Bison’s which are dedicated grooming machines and two are maintenance/transport vehicles. To give you some perspective of the magnitude of the grooming operations, the cost of these vehicles runs in the vicinity of $400,000 each. In addition to the drivers, it takes a staff of six full-time mechanics to keep the cats on the hill. Those 100+ nights with 16 hours of grooming put a lot of wear and tear on the men and the machines. Ken Mack is the Snow Surfaces Manager at Loon. 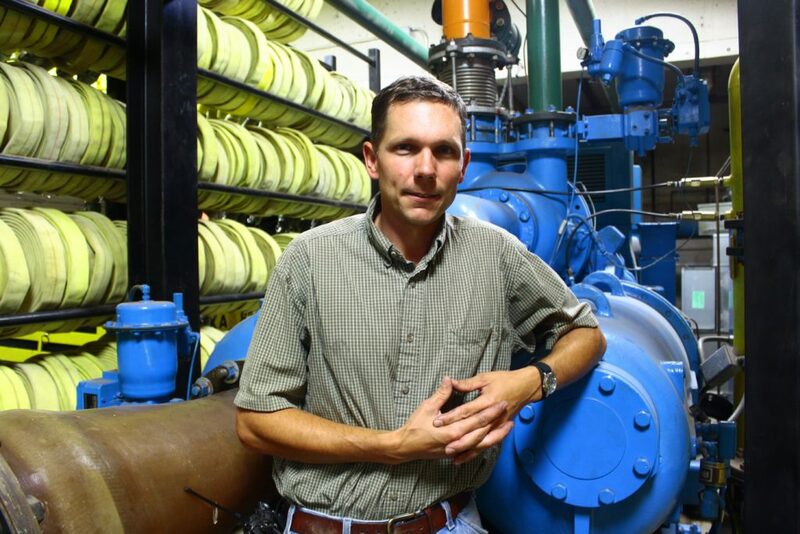 He’s the man responsible for all snowmaking and grooming on 322 acres and nearly 28 miles of trails at the resort. As is the case with anyone with his responsibilities, when the skiing is great he’s a hero. When it’s not he takes the heat. But that’s OK. He’s a Former Marine and can take it. Ken also comes from generations of snowmakers and groomers. He started making snow at 14 and did that for 3 to 4 years. He’s been at Loon since 1999 making snow until 2005, moved up to snowmaking manager, and then on to managing the grooming ops as well. Ken is now celebrating his 20thyear at Loon. Given the investment these machines represent, not just anyone can hop into the cab and go to work. I asked Ken what goes into training a driver to be a skilled operator. 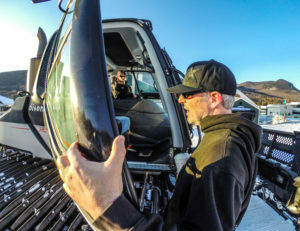 He said while he was self-trained, Loon’s drivers receive at least 16 hours of training before they’re allowed to work on the mountain. They must be thoroughly comfortable with all of the cat’s controls. Beside just steering the vehicle with the two tracks they have the blade on front and the roller on the back to manipulate. Given the expertise and the team attitude crew turnover is very low. Vacancies are few and promotions are nearly always from within. Grooming the mountain is not as simple as it may appear. It takes planning and timing. I asked Ken how he determines where to groom and when? He told me the rule of thumb is to groom if it’s under 32 degrees or if new snow has fallen. At Loon, that’s pretty much every night. They start with the steepest trails first since they’re the most difficult to do and the crew is fresh. In Loon’s case that’s South Peak to North Peak to the main mountain. They wind down their night on the easier terrain on the lower mountain and “head to the barn”. Much like snowmaking, grooming has revolutionized the snow riding experience. These days they go hand in glove. You can’t ski without snow, and you can’t sell many lift tickets without grooming. This was especially true in the East this season with several freeze thaw cycles impacting surface conditions. More than once I glided down beautifully groomed trails with nothing but boiler plate and concrete just a few feet away on the ungroomed sides of the trail. We all have Ken and his dedicated crew of snow farmers to thank. And we do.